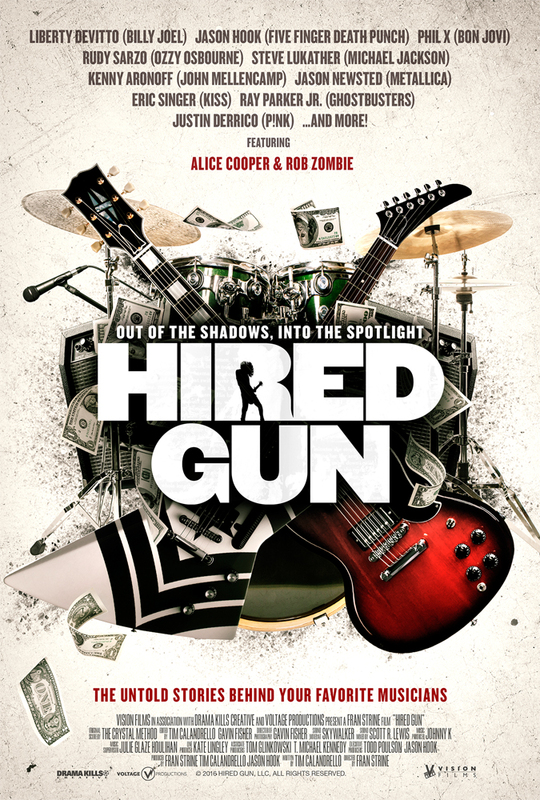 Home›Features›Hired Gun - New Film Looks at Neglected Contributors in the Music World! This is the premise behind Hired Gun, a film that takes a look at the overshadowed players in the music industry, who are essentially “on the sidelines” in the studio and on the stage, helping artists to polish their music, bring their tunes to life on stage, and to help them cut the songs for album releases. No two hired gun experiences are the same, with some of these side players being in demand in the industry, and others finding themselves with no job security and slave wages. 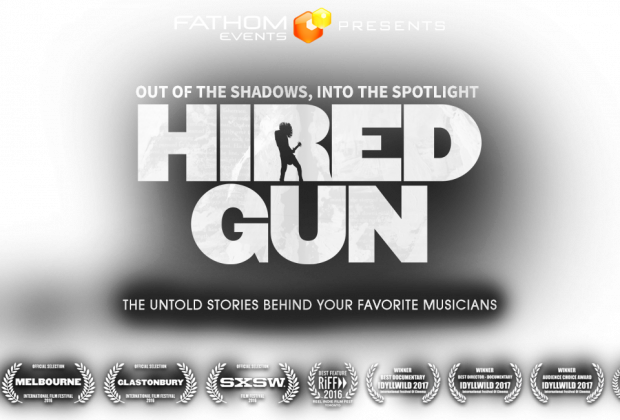 Hired Gun had previously premiered at the 2016 SXSW Festival, and was shown in theaters for one night only through a Fathom Events showing on June 29, 2017, in theaters across the United States. The film has since received a home release. 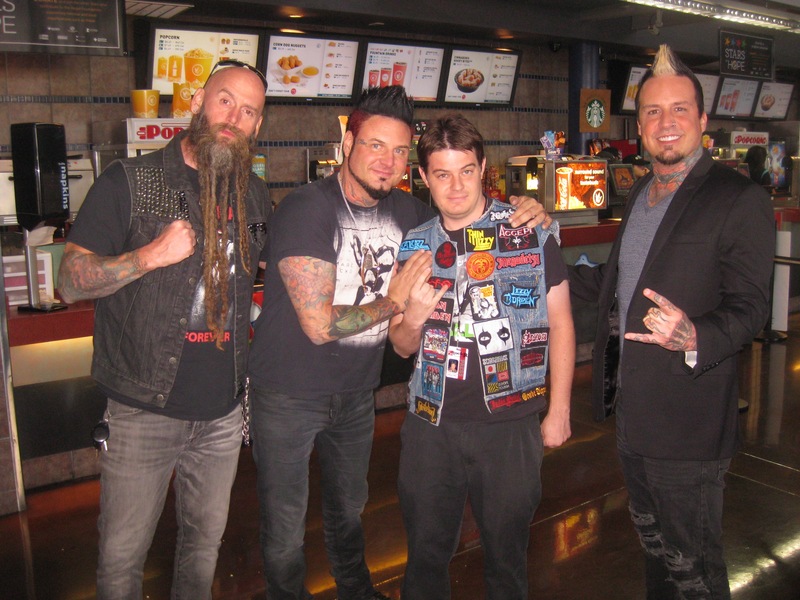 I attended the screening at Regal Village Square here in Vegas, which was also attended by Five Finger Death Punch’s Jason Hook, Jeremy Spencer, and Chris Kael. 5FDP guitarist Jason Hook appears in the film and also served as one of its producers. Taylor with the members of Five Finger Death Punch, from the meet and greet prior to the film. While this particular event/screening did not feature a traditional red carpet event, the members of 5FDP did a free meet and greet in the theater lobby, taking pictures and signing autographs with their fans. In a world where arena-level bands are charging outlandish fees and costs for meet and greets, the fact that the 5FDP members took the time out of their schedules to do this definitely comes as a breath of fresh air. These guys are a class act, and made sure that no one missed out on an opportunity to get a photo or signature if the fans in attendance wanted it. -Five Finger Death Punch guitarist Jason Hook (who also co-produced the film) discusses his beginnings as a backing musician for Hilary Duff, later rising to the occasion with artists like Vince Neil and Alice Cooper, ultimately deciding to take a chance on an up-and-coming band looking to fill a void. The band, of course, was 5FDP, who he has been with ever since. 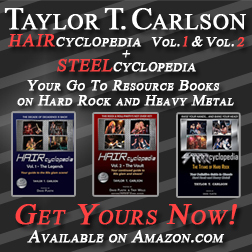 -Bassist Rudy Sarzo talks about going from sleeping on a floor following the collapse of the original Quiet Riot (with Randy Rhoads) to playing stadiums with Ozzy Osbourne. 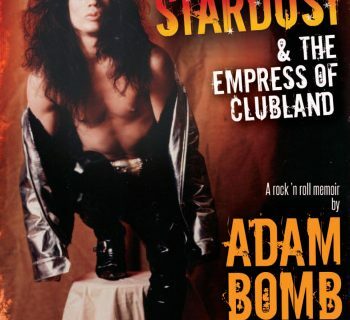 His segments also discuss the death of Randy Rhoads in a plane crash, and the aftermath in which guitarist Brad Gillis has to be brought in to cover existing tour dates, only to be victimized by crowds deeming him an “unfit replacement.” Sarzo also discusses the music “losing its fun” during these times, and returning to a reformed Quiet Riot to recapture those elements. -Liberty DeVitto, a drummer in Billy Joel’s band, discusses his ongoing relationship with Joel and being a part of that man’s backing group for decades, only to find himself the only remaining member in the group following a mass firing, and eventually unceremoniously let go himself. Despite this, he remains a humble, forgiving man and one that find a new lease on life teaching kids about playing music. -Steve Lukather, guitarist of Toto, looks deeper into the roles of “hired guns” and how he has been one himself in addition to his role in Toto. He also discusses (in a rather humorous fashion) his doubts about the Michael Jackson song “Beat It,” to which he contributed guitar parts, only to find his doubts comically shattered. These are just a handful of the stories that you will get to hear in Hired Gun; the movie does a brilliant job at unearthing the lives of these men and women who put themselves on the sidelines for a paycheck as they get the “stars” what they want. I am glad to see a film like this get made, giving credit where credit is due, not to mention showing the positive elements and the unfavorable pratfalls of living this life. The sheer variety of stories offered here all present different outcomes, which may or may not be favorable to the artist. No two hired gun tales are the same, and that is one of the pervading themes throughout this documentary. 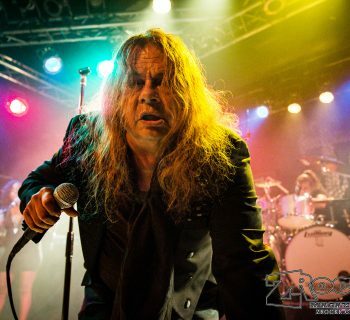 The creators of this film succeed when it comes to picking out a diverse cast of musicians, covering genres that are, surprisingly and impressively, NOT limited to classic rock and hard rock/metal! Some of my favorite moments in the film, of all things, came from Ray Parker, Jr., who was brought in at the eleventh hour to write and record the theme song to the film Ghostbusters. He also gives the audience some words of wisdom about the importance of making a “classic song” over a “hit song.” Other artists interviewed include musicians that have backed pop artists like Pink. While the rock/metal artists tend to be the most emphasized, I was pleased to see the movie not being afraid to branch out here. Many misconceptions and false assumptions people make are also addressed here, which stands as another strength of the film. People think that if a musician plays with someone famous, they are automatically wealthy. This is demonstrated well in a scene with one of the film’s hired guns going from doing performances on stage, to house painting just to make ends meet on his days off from the road! These harsh realities are a revelation, and will be an eye opener to viewers. As such, the movie does a good job showing just how unprofitable and unforgiving an industry this is. There are a few minor faults with the film, though they don’t change my overall positive view of the movie. -Firstly, the movie throws a TON of musicians at the viewer, almost as if it expects the viewer to already be at least somewhat familiar with them all. Similarly, the movie jumps back and forth between artists’ stories at an alarming rate in its run time of just under 100 minutes. I thoroughly enjoyed these stories but the movie almost has too many of them, and some are better developed than others; Liberty DeVitto’s stories with Billy Joel practically could have been expanded to be their own film. Hired Gun reaches far and wide, but at times, it almost feels like a little too much, even if it does provide an accurate portrait of the life of a hired gun in the music business. -There are also issues with the “subtitle cards” that introduce artists. Absolutely NONE of these appear in the opening scenes of the movie prior to the opening credits concluding (which is the perfect time to start introducing people), and even in the movie, they either seem to pop up too frequently, or not enough. I don’t think the cards even introduced Rob Zombie properly until his third or fourth appearance on screen. Likewise, there are times where they appear too frequently; a man is introduced in one scene with the “subtitle cards,” and they are there again a few seconds later when we see him again. Reintroduce someone when they’re brought back after a lengthy absence, but don’t do it every single second. Likewise, don’t not bother introducing someone at all until their third or fourth appearance, either. This is a minor flaw that is more of a production issue than a problem with the film at large, though. -The third and final issue I will mention is that many these stories are far from complete. 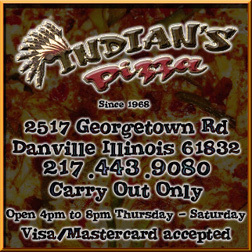 In Rudy Sarzo’s segment, there is not a single mention of his later work with Dio or Blue Oyster Cult, even though these later gigs of his actually, ironically, better fit the “hired gun” category than much of his earlier work. The flaws here are minor, and I truly believe fans of the music industry are going to enjoy this revelation of underrated and underappreciated contributors in the music world. Hired Gun is a fantastic film with a long overdue premise, and the end result is one music fans will not be disappointed with. At this point there has not been a home video release announced, nor have there been any further showing/screenings announced. But when it becomes accessible and viewable to audiences again, the movie is highly recommended. Falling Home - Pain of Salvation Gives Audiences a Collection of Reworked, Acoustic Versions of Their Material!